We hope everyone had a wonderful Memorial Day weekend! We had a lot of fun-here's a quick breakdown. Saturday: We did a little shopping looking for all those Memorial Day sales. We didn't do quite as good as we had hoped, but that's ok. That night we hiked the Y with Reed's old roommate, Craig and his fiance, Heidi. We enjoyed the great view from the top and had some much deserved Frosty's after! Sunday: We were the keynote speakers in sacrament meeting at church and then hurried home for the best French toast with fresh strawberries and whipped cream on cinnamon raisin bread! It was so good! 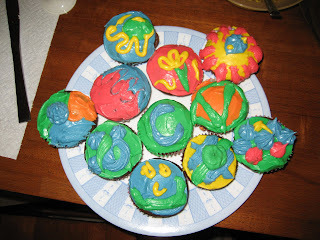 We ended our night by making and frosting some cupcakes! Our frosting wasn't quite the right consistency as you can tell from the picture! Monday: Reed took me to the park to play tennis for the first time. It was pretty ugly, but we had fun and are excited to get better. The highlight of the day was trying a new recipe for dinner. We made Kung Pao chicken and I'm so impressed how well it turned out! It was really good! Today we found out that Reed made the MPSF All-Academic Team! He was one of only four BYU players to make it. Way to go Reed, keep it up! Yeah, Tiona is Dean's cousin! Crazy! Hey I miss you, it's been WAY too long!